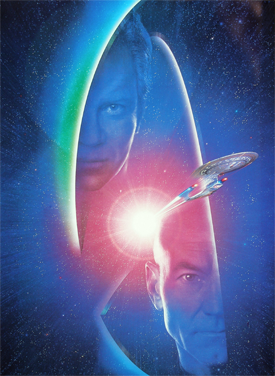 Synopsis: In 2393, Captain Kirk seemingly dies in sacrifice saving the Enterprise-B and many El-Aurian refugees from a mysterious energy ribbon that possibly leads to a perfect eternal dream. 78 years later, the crew of the Enterprise-D deal with the mad machinations of an El-Aurian willing to destroy whole civilizations to return to the dream of that ribbon. • The enigmatic energy ribbon, or Temporal Nexus — manifested via Whoopi Golderg’s Guinan, stole the show in its active role in the events. • Kirk (William Shatner) and Picard (Patrick Stewart) played well off of each other in their later scenes. They were an Odd Couple, but as Starfleet Captains, they created a dynamic harmony. • Dr. Soran (Malcom McDowell) was an overall strong character study in obsession, and how one can loose all they once deserved. • The humor of having Data (Brent Spiner) having his emotion chip installed helped to make up for the weaker parts of the film. • The only memorable parts were the beginning and end of the film, while it felt almost ironically like a lesser two-parter from TNG. • One or two scenes with Picard might just represent Patrick Stewart’s worst performance, suggesting the director was not paying much attention in some scenes. • There was likely no way to make everyone happy with how they left Kirk. I HAVE TO GO BACK! I HAVE TO GO BACK! For all its faults, Generations did have a fascinating plot. The Temporal Nexus was very much alive, and fully aware of what it could provide for sentient beings long weary of a dangerously indifferent universe. Whether it was intentionally created to provide some kind of Heaven is anyone’s guess. Yet, that just added a palatable level of mystery it did not deem necessary to provide to Kirk and Picard. At the same time, what it provided created a quiet debate of ironically negative effects of Kirk and co again saving many lives. Years before, TNG told us that the El-Aurians were fleeing from the Borg, who assimilated nearly their entire race, so El-Aurians might literally have had a chance to find a peace they no longer thought was possible. Indeed, Guinan, Soran, and all the rest of the “rescued” El-Aurians were forced to “live” knowing they could have had a peaceful eternity. Most, like Guianan, worked to just live, but some, like Soran, came to only care about reentering the Nexus. Soran turned himself into a worse monster than the Borg to force his way back. What he did not realize was that the Nexus could judge those that seek its eternity. The best part of the film was how the Nexus manipulated Picard and Kirk to kick Soran out permanently. Indeed, it might as well have choreographed Soran’s demise! A worthwhile, enigmatic journey.